If I had to pick one dessert on my blog that I suggest you make as soon as possible it would be this one..oh and this one too according to my husband who just reminded me I have not made them in a few weeks. As I mentioned yesterday I have decided to start eating Paleo. This means no dairy. What would the world come to if there was no ice cream? It would be a sad place. I don't care what diet your on ice cream needs to be allowed. The good news is, if you are cutting dairy out of your diet or you just want to have a healthier option to regular ice cream this is the solution since it is made with coconut milk. This recipe is my own creation and right up to the point of tasting it I had no idea how it would turn out. My two year old was anxiously waiting for the whole 20 minutes while it was churning it the ice cream maker, so thankfully it was a huge success. I am not a fan of meltdowns. Mash the strawberries up in a medium size bowl. Add all the other ingredients and mix them together. Place your ice cream mixture into an ice cream maker. Follow the directions of your ice cream maker and watch the magic happen. *If you do not have an ice cream maker you can still make this, although the end result will not be as creamy. Full instructions can be found here. Heaven in a little bowl. This was creamy, refreshing and had just the right amount of sweetness. It reminded me of a delicious sherbet but without all that extra processed sugar and milk. Thank you for this and the post you shared yesterday. Because of you I am 100% going Paleo! I have no clue how you find the time to make all this yummy stuff with two young kidos, but I too guess I can find time if I want it bad enough. this looks delicious! i need to steal my moms ice cream maker and attempt this. Definitely needing some desert in my life! I'm loving your Paleo recipes. I just checked some old ones. They look really yummy and healthy. I should try them soon, right after I check it with my nutritionist because I am on a special diet myself. This looks so good! Now I need to buy an ice cream maker...my husband and I have been 99% dairy free (and vegan) for about a year now, and ice cream is definitely in the top 5 things I miss!! Haha. I am not a fan of tantrums. Me neither! And the ice cream looks really good. I bet the coconut milk is a fantastic addition! Looks fantastic! I would love an ice cream maker! Looks fantastic! Any recommendations on an ice cream maker? Hi, this looks so yummy. Just wondering what size your coconut milk can is? We are in Australia so our standard one might be different to yours. Can't wait to make this! Lindsay, what brand of coconut milk do you use? Verdict: super tasty & light! A little icy but that's because I didn't use an ice cream maker. Thanks, it is our standard 400ml can. Will be making this today now! I literally just asked my husband this week if he had seen any good Paleo recipes for ice cream - this recipe looks awesome! Thanks for sharing! I just found your blog on Pinterest because of a craft that was pinned, and I love it!!! I was also super excited to see that you are starting to eat paleo. I eat that way and it has helped me immensely with a lot of health issues (I have multiple autoimmune diseases). Seeing that you have Type 1 Diabetes, Paleo is an excellent way of managing that and may even help you to heal as it seems to be a good method for healing autoimmune-related issues. I highly recommend reading "Practical Paleo" by Diane Sanfilippo - http://www.amazon.com/Practical-Paleo-Customized-Whole-Foods-Lifestyle/dp/1936608758/ref=sr_1_1?ie=UTF8&qid=1344967266&sr=8-1&keywords=practical+paleo. She has a whole section on autoimmune diseases (including type 1 diabetes) and how to customize paleo for those issues. So excited to start reading your blog on a regular basis. Blessings to you! Congratulations on your new son! Lindsay, what kind of ice cream maker machine do you have for this recipe? Will this make 1 quart? Thanks. Is it supposed to be two tablespoons of vanilla or teaspoons? I'm not sure what I might have done wrong here but it was very very wrong. Do you know how much (or how many servings) it makes? Planning to make this tomorrow and I am just wondering how much it makes. I have never made ice cream before but received on for Mother's Day. It can hold 2 quarts, can I double the recipe? or will it be enough as is? I made this tonight. I can't really taste the lime or the coconut. 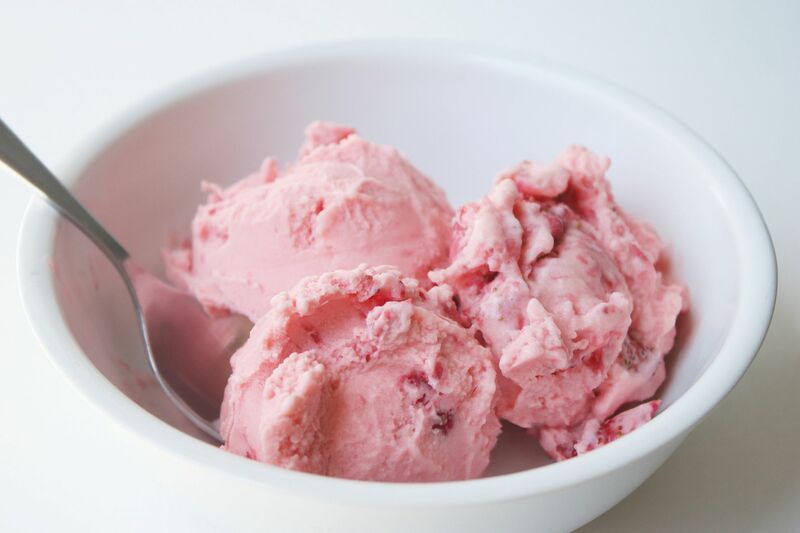 My husband said it tastes just like store bought strawberry ice cream if it didn't have any sugar in it. Next time, I'll probably add a bit more honey as the sweetness was lacking. 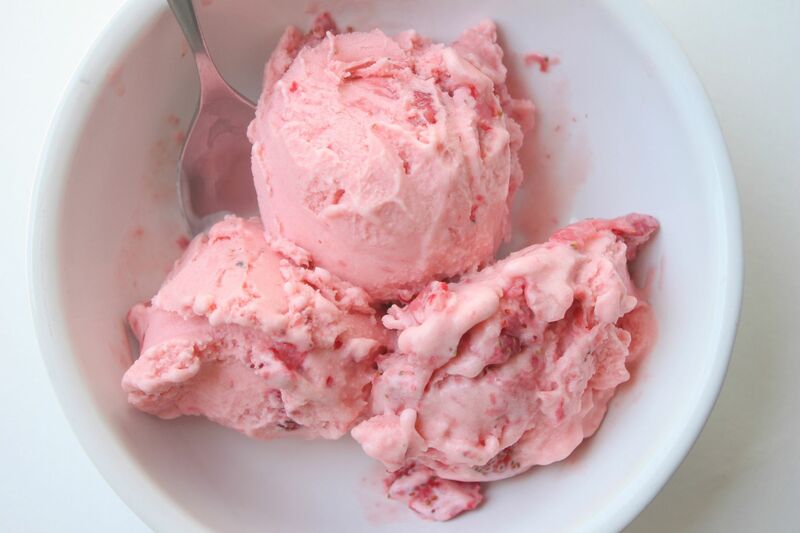 If you don't have an ice cream maker, just use frozen strawberries and blend everything together.